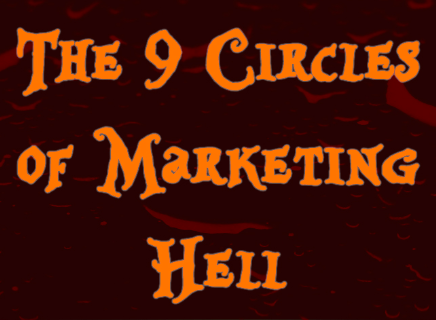 The 9 Circles of Marketing Hell: Where Will You Spend Eternity? We've all committed marketing offenses. Hopefully nothing bad enough to get yer arse canned, but you know, people mess up. But sometimes there are offenses so egregious, so blasphemous, so INCREDIBLY REPREHENSIBLE that we just can't help but ... make a content visualization about it. Whatever, we're marketers, that's what we do. To put these marketing sins into perspective, we organized them into the 9 circles of marketing hell -- our own little spin-off of the literary classic, Dante's Divine Comedy, better known as Dante's "Inferno." Muaaahahaha. 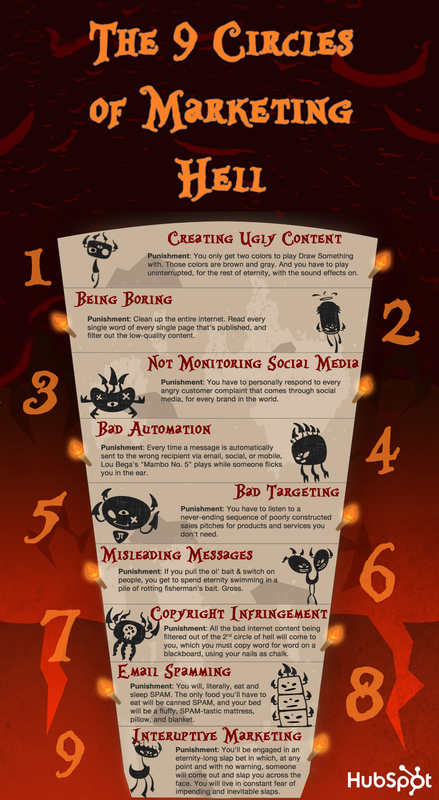 Take a look at the 9 marketing sins that could land any of us in an eternity of fire and brimstone, and most importantly, the tedious, sometimes torturous punishments that we'll have to endure for committing these sins! You know the stuff, it's hard to consume, with giant chunks of long text, and no images or formatting to break it up. The Punishment: You only get two colors to play Draw Something with: brown and gray. And you have to play uninterrupted, for the rest of eternity, with sound effects on. The internet is full of stuff, stuff, stuff. The last thing we need is something unremarkable and unoriginal that puts an audience to sleep. The Punishment: Clean up the entire internet. Read every single word of every single page that's published, and filter out the low-quality content. People are using social media to communicate with you -- for customer service, research, and sales -- whether you like it or not. Don't leave 'em hangin'. The Punishment: You have to personally respond to every angry customer complaint that comes through social media, for every brand in the world. The Punishment: Every time a message is automatically sent to the wrong recipient via email, social, or mobile, Lou Bega's "Mambo No. 5" plays while someone flicks you in the ear. Hi [FIRSTNAME], Are you interested in buying more cat food? ... said the email to the dog owner. Major faux pas. The Punishment: You have to listen to a never-ending sequence of poorly constructed sales pitches for products and services you don't need. Don't dupe people into clicking your blog post, email, call-to-action, or anything else with tricky copy that promises something you don't deliver. The Punishment: If you pull the ol' bait & switch on people, you get to spend eternity swimming in a pile of rotting fisherman's bait. Gross. Copying and pasting someone else's content, without permission, and with no credit given (not to mention an inbound link) isn't just bad internet etiquette, it's bad marketing that results in duplicate content for which you'll be punished in the SERPs. The Punishment: All the bad internet content being filtered out of the second circle will come to you, which you must copy word for word on a blackboard, using your nails as chalk. I've said it before, and I'll say it again. Email inboxes are sacred. Oh, and also, email spamming is illegal. Double whammy! The Punishment: You will, literally, eat and sleep SPAM. The only food you'll have to eat will be canned SPAM, and your bed will be a fluffy, SPAM-tastic mattress, pillow, and blanket. There's a lot you can do to annoy your audience, contacts, and even your fellow marketers, but nothing's more annoying than interrupting someone's day. To sell them something. That they probably don't want, anyway. The Punishment: You'll be engaged in an eternity-long slap bet in which, at any point and with no warning, someone will come out and slap you across the face. You will live in constant fear of impending and inevitable slaps. What other sins would you add to this marketing inferno?